That term went viral four years ago, but it has been around since 1853 (!) and in peer-reviewed papers since at least 1939. Is the relatively recent attention warranted? Is this meteorological term becoming part of the vernacular a good thing or not? Is it always the culprit of frigid arctic outbreaks? For that matter, what the actual heck is the polar vortex? The answer? Like many things in our world, #ItsComplicated. The polar vortex involves science — such as the phenomenon’s atmospheric altitude, geographic size, and longevity — and semantics, including the vs. a, and adjective & prefix usage. 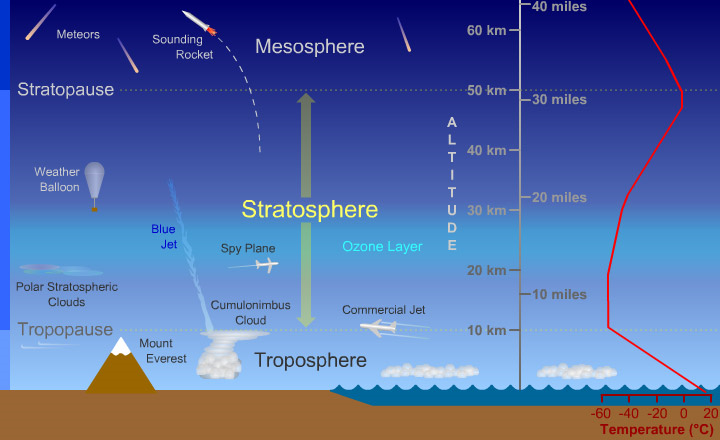 The lowest two layers in the Earth’s atmosphere are the troposphere and stratosphere. In turn, that’s where the two large-scale components of the polar vortex are, per the banner graphic above this article. The vortex can be envisioned as a ginormous inverted tornado-like cone, with a broader irregular tropospheric circulation below and extending up into a tighter more regular stratospheric polar vortex; and there are also relatively small sub-vortexes (or vortices if you prefer) partway up at the interface between the troposphere and stratosphere, known as the tropopause. Now, here’s a breakdown of the three phenomena and their terminology generally used in the scientific literature. This atmospheric feature arguably is the polar vortex in its truest sense, especially as we get above the lowest levels and into the middle stratosphere, where it’s most consistently a well-defined circular or oblong vortex with the center over or close to the poles. The strength peaks during each hemisphere’s winter. This one is lower in the atmosphere in the portion of it in which we live, known as the troposphere, and in the scientific literature the polar part of the term is most commonly used with the circum- prefix. Presumably that’s because rather than being a vortex tightly spinning near the North Pole or South Pole, this year-round circulation extends very broadly around them. Furthermore, the edge is irregular, like a giant atmospheric amoeba. This vortex is the one directly responsible for delivering cold weather to lower latitudes. In fact, those undulations — lobes of the vortex representing ridges and troughs, of so much fundamental importance to so many weather phenomena — transport hot air too. (But you don’t usually see headlines blaring “Polar Vortex Brings Heat Wave!”) For that matter, along with tropical/subtropical influences, the tropospheric circumpolar vortex is directly associated with most of the weather you experience in mid-high latitudes and in turn also affects the weather in the tropics/subtropics. The atmosphere is all an interconnected three-dimensional fluid, and the stratospheric polar vortex and tropospheric circumpolar vortex, while distinct features, are connected and can influence each other. Adding to the technical and communication complexity is a third type of vortex. Within the big tropospheric circumpolar vortex in that recent/forecast graphic above is a cold gyre over Canada (centered in the green area), which is sending cold air south of the border and infusing it into snowstorms. In the core of it is what’s known as a tropopause polar vortex (TPV), the circled white/blue spot below. The existence of TPVs and their linkage to cold air outbreaks have gained recognition in recent years in the meteorological community. I don’t know why they’re not called arctic tropopause vortexes, since while they originate in high latitudes, they aren’t necessarily right at or near the poles like the stratospheric polar vortex and the broad center of the tropospheric circumpolar vortex. In any event, unlike those two, there have been thousands of these over the years which come and go. Thus a rather than the one and only tropopause polar vortex. What may have contributed to the confusion and virality is a questionable conflation of the tropospheric circumpolar vortex and tropopause polar vortexes, in which a lobe of the former is portrayed as the polar vortex. Even without that issue— if there would be agreement and clarity on the three main terms/phenomena above — to what extent will such science and semantics be routinely used in today’s soundbite, binary-no-room-for-complexity, sensational-headline, #hashtag world? The term has been around since 1853, is that when “ginormous” started, too? Wonderful compilation of different graphics illustrating these weather cycles, made understandable for us non Geeks. We just love weather explained at The Weather Channel! This is what makes it more interesting. Thank you very much. I was amazed to know how the polar vortex effects this cold weather.